Business Hours: 11.00am – 10.30pm. FOR something other than yee sang this Chinese New Year, try Tony Roma’s brand new “Roma Italia” dishes. The chefs have infused traditional Italian herbs and flavours in their new “Roma Italia” menu. Most of the recipes in the “Roma Italia” menu features Asiago cheese, an Italian cow’s milk cheese that can assume different textures according to its aging. This interesting semi-hard table cheese gets its name from its origins, which is a town in the Veneto region of Italy. As an appetiser, start with Chicken Ceaser Flatbread, a delicious crispy thin-crust flat bread topped with grilled chopped chicken breast, Italian cheeses, tomato pesto salad, fresh sweet basil and creamy Ceasar dressing. While the cheese in this dish is generous, its flavours does not overwhelm, making it a great appetiser. If you enjoy sandwiches, try the Nolita Deli Panini, which consists of many layers of thin-sliced smoked turkey, Genoa salami, melted Havarti cheese, homemade Italian spiced pepperoncini and caper sauce. This dish was tasty and the combination of turkey and salami certainly worked in its favour. The dish went well with the thick French fries that were served as a side dish. The red-meat alternative is the Nick’s Ultimate Steak Panini, which is filled with grilled juicy tenderloin, cheddar, caramelised onions, fresh tomatoes, lettuce and Dijon mustard. The sweet taste of the caramelised onions complements the saltiness of the dish. 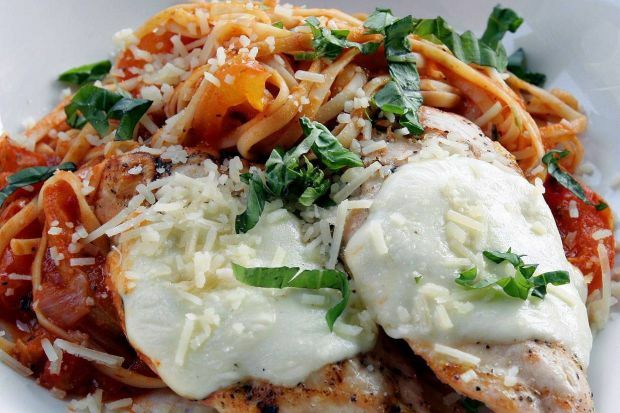 Pasta-lovers will enjoy the Chicken Caprese Linguine, which is served with grilled chicken breast covered with fresh mozzarella and roasted tomato sauce. What makes it flavourful is the roasted tomato sauce which lent the dish a fresh taste. Combined with Roma tomatoes, onions and Asiago cheese, this dish was served with the linguine cooked al-dente, perfect for individuals who do not like their pasta overcooked. Another sumptuous choice from the menu is the Pappardelle Rustic Italian Sausage Pasta. The sausages, which are actually lamb meatballs, are handmade — a combination of minced lamb and mixed Italian spices. These sausages are then slowly roasted, retaining its juices and flavour. It is then tossed with tomato sauce, onions and Asiago cheese, giving it a wonderful texture. The Triple Citrus Tropical Smoothie is an ideal accompaniment to the heavy meal. This creamy citrus mocktail delight has orange juice, banana and kiwi in it, and is topped with whipped cream. There is also a choice of Strawberry Kiwi Orange Punch, which is lighter and refreshing without ice-cream, with a strong berry flavour. The dessert that comes with the menu is Fresh Fruit and Mascarpone Cake. The sweet mascarpone cheese frosting is sandwiched between two rounds of moist yellow cake, which is then crowned off with fresh strawberries and blueberries. The selections in the Roma Italia menu range from RM12.90 for the mocktail to RM35.90 for the main dishes. The promotion is until Feb 26.